If you’re active, there’s a good chance that the topic of food is never far from your mind. But when I’m not dreaming of what I’m going to eat as my post-workout/race treat, I’m thinking of what to consume during the event – i.e. fueling up to go the distance. Most of us have a general idea of the science here: To prioritize maximum athletic performance, you want to ensure that you’re using your glycogen premium fuel tank as much as possible. But that’s where the art comes in, especially because no two athletes will have the exact same fueling requirements at any given time. Too much fuel early, and your body will convert the excess carbs into fat. And too little fuel too late results in early fatigue and diminished performance. But how do you know what you need, other than going by feel or estimating expenditure? That’s where Fuelstrip comes in — to try to take the guesswork out of your fueling game with its “custom sports energy” technology. Test Your Sweat. Swipe a fuelstrip with sweat at regular intervals during a workout. Get Results. 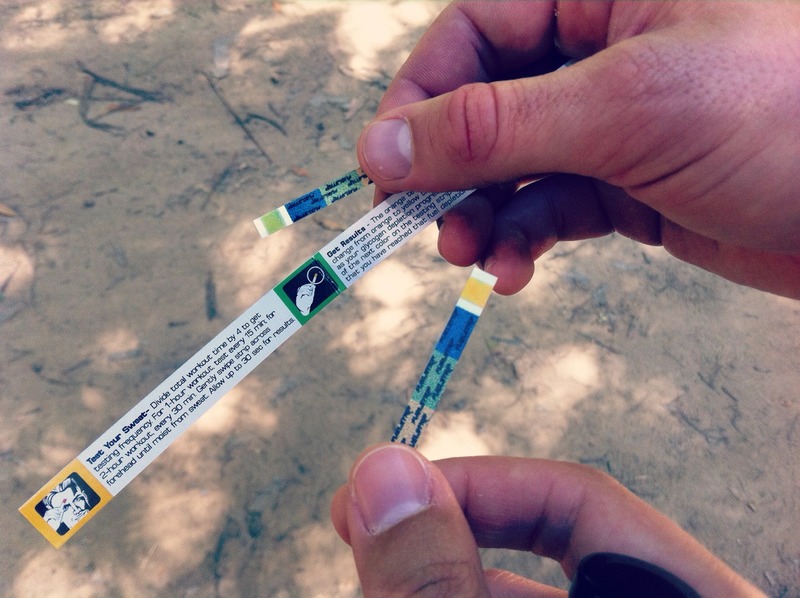 Watch the strip change color to reveal you body’s exact level of depletion. Refuel. Ward off fatigue by eating the corresponding number of carb- and electrolyte-filled chews. But in reality? Well, I first tested the strips during a P90X session at home with mixed results. My strips stayed in the orange range, which meant one of two things: Either my glycogen reserve tanks were pretty topped off…or the technology wasn’t working (regardless, the chews are yummy). 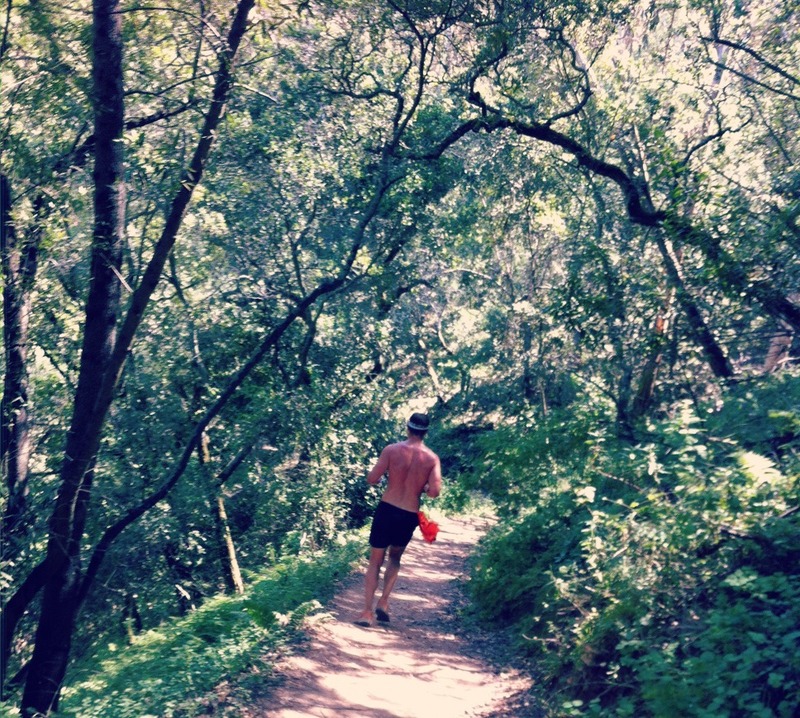 So I decided to do a second experiment — this time using Hubby as my co-guinea pig during a recent 13-mile trail run. I did my usual pre-run routine. Hubby? Not so much. He had a smaller-than-usual breakfast and opted not to carry fuel on the run. About halfway through, we were both feeling pretty beat by the heat (the SF summers have softened us! )…but, as you can see, his lack of fueling was also starting to kick in. Needless to say, he happily accepted the bag of chews as we made our way along. A few miles later, we checked again — I stayed the same yellow/orange color, but Hubby’s green was a little less vibrant this time around, so we declared the test a success. Would I use ’em every time I exercise? Probably not. Personally, I’ve got a decent idea of what to eat — and when — for most of my regular workouts. But if you’re starting a new routine or unsure of fueling over longer distances, it’s smart to consider setting a baseline. 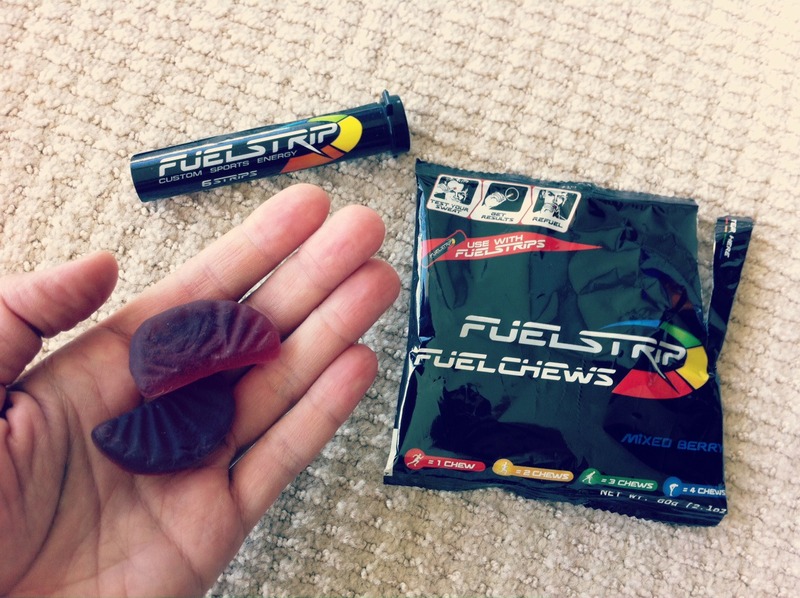 For example, as I figure out fueling for longer training rides and trail runs, I’ll be spot-checking with Fuelstrips to make sure I’m eating enough along the way — especially as I’m less able to rely on hunger as an indicator. Because, unfortunately, there’s no one-size-fits-all solution when it comes to fueling — but getting it right can mean the difference between finishing strong or bonking before you cross the finish line. For more information or if you’d like to try Fuelstrips yourself, visit the website here.